The journey was exhausting. We expected it to be rough, but it’s been three days and we’re still trying to feel normal-ish. There’s the jet-lag, and the heatwave, and the fact that we packed far too many bags and forgot our stroller. Then, a tummy bug knocked out several of us, leading to even more exhaustion as we both try to adjust to normal daylight hours but are unable to sleep at night. Joe & Lucy had a long walk through the empty train station the first night, and we’ve all been napping through “housekeeping” at the hotel during mid-day. We are reveling in the foreignness, enjoying the walking experience and all of the yummy foods we have been able to try. 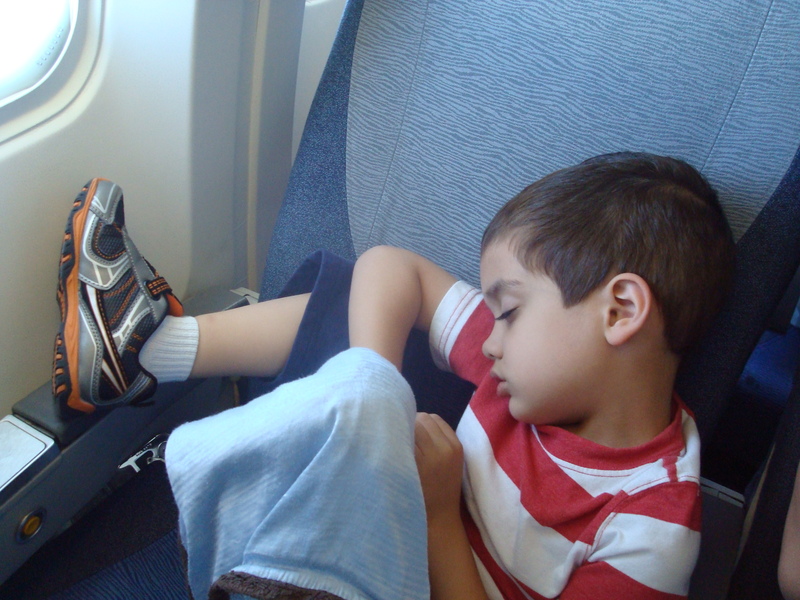 Sam, our grumpy 4-year old, isn’t making for a very positive travel companion, but we’re trying to work on that. He’s expressed homesickness more than once, and has yet to find any food he really likes, poor kid. Other than gummy bears, of course. It took us two days to find enough travel adapters to charge our electronic devices, making us feel even more isolated from our friends & family back home. Our hotel is the InterCityHotel, which is actually built as part of the train station complex, putting us right at the heart of the loudest part of the city. And since it’s been dreadfully hot, we leave our window open at all hours. So we’re all becoming very familiar with the sounds of police sirens, drunken people after midnight, and drag-races taking place just outside. 5 bags, 2 carseats, and 5 carry-on items is FAR too much for two adults to handle. German flight stewardesses are (for the most part) quite rude. German public bathrooms have toilet paper MUCH rougher than America, and paper towels by the sinks that are soft and velvety. Carbs are easy to come by (and delicious), but good luck locating any vegetables! The only we’ve found so far are the occasional bit of lettuce on a sandwich or some creamed carrots as part of a cafeteria buffet. Sam loves escalators and will hunt them out in every department store and train station. It’s interesting to be out around 8pm in this smallish European city – there’s the families with kids wearily heading home and the scantily-dressed youth heading out for a night of partying. Venture out at 6am and see the reverse – my kids, skipping over the cobblestones as the hungover masses do the walk-of-shame back home. This entry was tagged Exploring, Foreign, Travel. Bookmark the permalink. Sam and Lucy couldn’t be in better hands. I’m glad you are discovering some of the joys of city life along with the drawbacks. Is there a grocery or market nearby where you can buy some fresh fruit? Some fruit stalls around, although they don’t keep our PDT sleep hours (my kids are usually hungry for dinner after 9pm). And a twice weekly market at the church, but we slept through that yesterday. We’ve found cups of melon in the train station, and applesauce to have on hand in the hotel room. So at least that’s something! Looking forward to moving into our apartment where there’s a regular grocery store next door. Just not a top priority at the center of the city, I suppose.